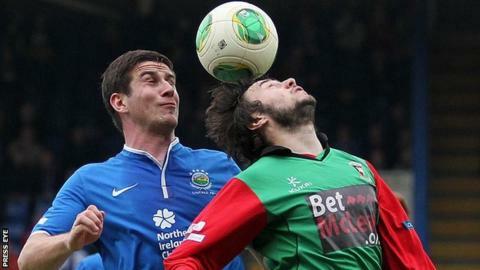 Linfield's title challenge ended with a whimper as they went down to Belfast rivals Glentoran at Windsor Park. The two-goal loss, coupled with Cliftonville's win over Portadown, meant that the Gibson Cup will reside at Solitude for another year. Second-half goals from Danny McKee and Jordan Stewart were enough to seal victory for the Glens. The result condemned David Jeffrey to defeat in his final game in charge of the Blues at a game at Windsor Park. Linfield had the better chances in the first half but Philip Lowry headed straight at Elliott Morris and then fired over the bar from six yards out. Andy Waterworth also drifted a shot wide as the teams went in level at the break. McKee latched onto a long clearance from Morris, outpaced a defender and tucked the ball under Jonny Tuffey on the hour mark for his third goal of the season. Stewart added the second with a header from seven yards out two minutes from time. Jeffrey will take charge of his side for the final time in Saturday's game against Irish Cup finalists Glenavon at Mourneview Park. Meanwhile Glens boss Eddie Patterson is thought to be mulling over the offer of a new two-year contract from the Oval outfit.